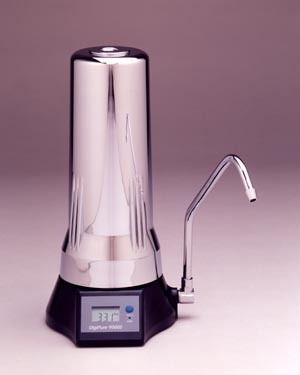 Our Multi Counter Top water filters systems eliminate the impurities of the Tap by combining different filter cartridges specially build to target specific contaminants. This well design system made by Water World USA use the most advance filtration technology together with a sophisticated and durable construction that guarantee the system performance. 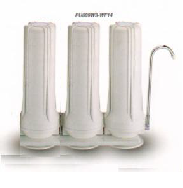 The multi stage counter top filters is the perfect solution for families that lives in apartment building or just for people that want to take advantage of the easy installation feature , but at the same time receive high quality drinking water. 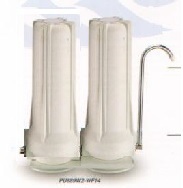 This stylish, easy to install model consists of Two Stage Filtration. 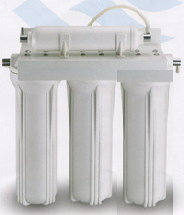 The First Stage is 1 Micron Sediment Filter that eliminates all particles greater than 1 micron in size including suspended solids. The Second Stage is carbon block filter for the removal of chlorine, taste, odor and other chemicals contaminants. The system comes installation kit that includes a white wrench for easy housing removal, 4 feet of white tubing 1/4" in diameter and a chromed diverter valve and external adapter for thread less faucet..
Get extra protection with this Three stage filtration system. The Second stage is a granulated activated carbon (GAC) cartridge that together with the Third Stage of carbon block filter removes chlorine, taste, odor and other chemicals contaminants. The system comes with installation kit that includes a white wrench for easy housing removal, 4 feet of white tubing 1/4" in diameter and a chromed diverter valve and external adapter for thread less faucet.. Robust in design and build to last, this 4 stage portable filtration system produces high quality drinking water. The Fourth Stage is an in-line carbon filter.